This beautiful "Windsong" tapestry shows the work of Diane Romanello. Know for her realism style of artworks, Romanello has gained admiration for her works from both private and corporate collectors. Her desire is to make the viewer feel as if they could walk into the scene. Her many works include outdoor scenes of pure nature as well as the aspects of nature which we interact with such as gardens, beaches, lakes and rivers. Diane was born in New York city and was self taught and developed a stlye of art full or romance and beauty. Here we see a road which is surrounded by autumn forest just on the cusp of the change in color. The trees are gorgeously rendered to protray the beauty of the light as it hits the leaves and branches to hint at the warmth from the sun. Her use of color and light is exceptional and is a hallmark of her works. 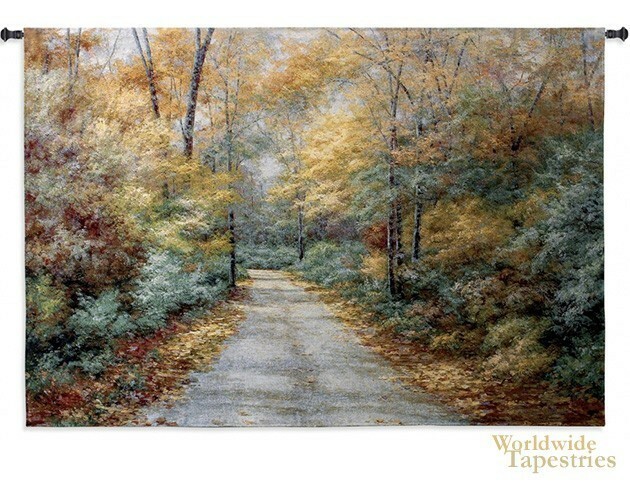 This landscape tapestry "Windsong" is backed with a lining and has a tunnel for easy hanging. Note: Tapestry rod and tassels, where pictured, are sold separately.